If you are looking for a romantic place for dinner, then you should consider 1 Una at rochester, a Spanish restaurant that is well known in the west. Its new Executive chef, Antonio Oviedo , has come out with a set of revamped menu to impress us. Fidea De Calamaris [$20] Must Try! This squid ink spanish noodle is just like our chinese bee hoon kind of texture. Calamari was savoury and crispy and went well with the noodle. Croquetas De Jamon Iberico[$14] Croquettes that filled with creamy ham bits. Great appetiser dish to start off with! Gambas Al Ajillo [$22] Must Try! Fresh tiger prawns sautéed with olive oil. Cooked with Chilli, Parsley and garlic, this would never go wrong! Heirloom cherry tomatoes salad with charred cucumbers and fresh burrata cheese. This dish is a little too pricey. Ensalada Cesar[$26] Spanish Caesar Salad – Grilled Spanish Sucrine lettuce, Idiazabal cheese foam, smoked anchovies and pomegranate. Slightly charred lettuce tastes pretty good! 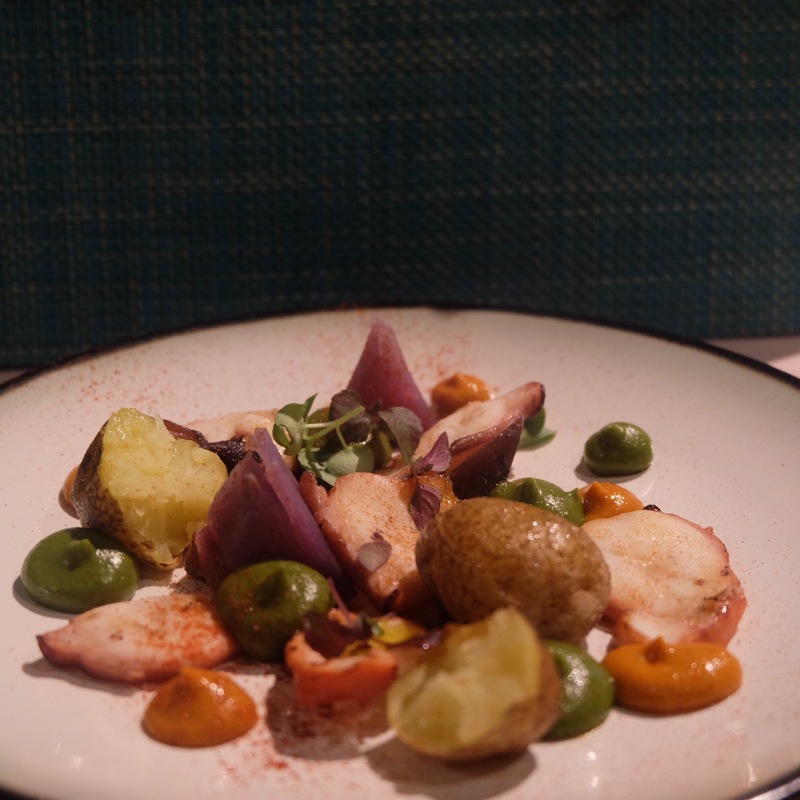 Smoked grilled octopus with baby potatoes, coriander and paprika sauce. Octopus is fresh, however a little too chewy for me. Baby potatoes were good though. Pluma Iberica [$38] Must Try! No,this is not beef. This is a delicious plate of grilled plume Iberica pork with patron pepper and creamy pumpkin. The meat was juicy and tender and it just melted in your mouth. Fruta De La Pasion, Fresa Y Aloe Vera[$16] Creamy passion fruit, strawberry ice cream and vanilla. Sour alert! Queso Fresco Calabaza Y Membrillo[$14] Fresh cheese mousse, roasted pumpkin ice cream and quince and walnuts. I quite like the cheese mousse but it tastes a little off when you eat together with pumpkin ice cream. Churros Con Chocolate Y Cafe[$14] Must Try! Crispy churros with dark chocolate and coffee foam. Very YUMMY!